"Sacred" was written by conscious Hip Hop artist J Brave while visiting the mystical lands of Sedona Arizona. He connected with fellow musicians and friends Kayt Pearl & Porangui and they weaved their magical expressions to help co-create this beautiful ode to Mother Gaia. The song reflects on the idea that all beings are sacred and holy instruments of the divine, and shares the powerful themes of Earth stewardship, honoring of nature, and celebrating Indigenous ways and culture. There's also a special shout out to the people who stood at Standing Rock, and to all activists who strive to defend sacred sites. The track was produced by legendary World Music aficionado Jah Levi, mixed & mastered by Daniel "Konscious" Krieger, and the video was directed by Amir Adib and Alexandra Sirocky. The song will be released on 9.21.17 by Unify on International Peace Day, and 100% of the Bandcamp single proceeds will benefit Honor The Earth supporting the preservation of sacred sites, Native environmental issues and the protection of indigenous culture. Limited Edition "Anishinaabe Woman Water Protector" - Size 18x16. Shipping out in December 2018 in time for the Holiday gifting season. Also include a special gift of Mural Gift Cards - both come wrapped in a pretty ribbon. This painting is by Votan (NRSGNTS), an indigenous artist, and is a huge mural in downtown Duluth, MN. Our Water Protector is an Anishinaabe woman, who is looking over the greatest of the lakes--Gichi Gummi. She is facing with prayer and the power of the Natural world, the greed of the Wiindigo, the fossil fuel industry, mining and lumber barons. She is powerful. Artist Statement: America suffers from historical amnesia. It is apparent that well into this millennium, the original inhabitants of this paradise still suffer the aftereffects of colonialism. People seeking freedom arrived on these shores over 500 years ago. It is unfortunate that in the pursuit of theirs, we were to lose ours. Corralled into areas deemed unfit for human survival, we overcame harsh conditions and thrived. The threat of our existence as a people has metastasized much like an autoimmune disease. Post colonialism has outgrown its life threatening behavior to the point that it's own life is under threat. One of the current issues, is oil. We are wise enough to see the effect of its intoxicating consumption. Beside it's pollution, the devastating effects it has in native communities is ostracized. This mural addresses this tiny fragment and puts it on a large platform. Women and children in our communities are being abducted, sold, raped and murdered for the pleasure of workers in this industry. If we address the problem, we can create solutions. Renewable energy, education and empowerment are vital. Let's change the beaten path of history. From Painting to Tshirt: This painting is by Votan (NRSGNTS), an indigenous artist, and is a huge mural in downtown Duluth, MN. Our Water Protector is an Anishinaabe woman, who is looking over the greatest of the lakes--Gichi Gummi. She is facing with prayer and the power of the Natural world, the greed of the Wiindigo, the fossil fuel industry, mining and lumber barons. She is powerful. ECONSCIOUS ORGANIC COTTON CANVAS FARMER'S MARKET BAG Features: · 100% certified organic cotton canvas · open main compartment · 21¾" self-fabric straps. Perfect for a laptop. Water is Life 2019 Calendar with Issac Murdoch’s “Water is Life,” artwork. Calendar is printed by recycled paper materials onto a nice 11x17 cardstock. Anishinaabe language in months, and days is also added. From the archives of artwork: Donald Montileaux (Oglala Lakota) Legder Drawing for Honor the Earth. In the late 19th and earth 20th centuries, Indigenous Peoples in the Great Plains, including Lakota, Cheyenne and Arapaho, developed a unique and powerful medium to document their history: ledger drawings. This image by Donald Montileaux, a master ledger artist is following in the footsteps of his forefathers, was designed for the 2003 Honor the Earth Tour. We have been working to create renewable and clean energy for years; keep the movement going. An art piece of history. 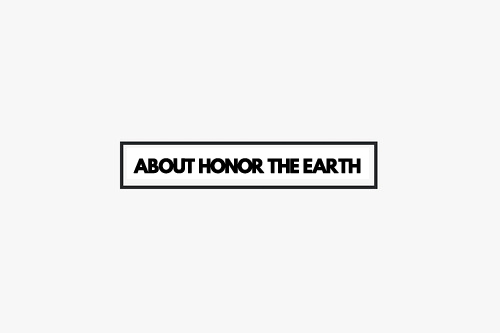 Honor the Earth supports the work, and indigenous resistance related to the Dakota Access Pipeline. We have (printed size 7” x 10”) #NoDAPL Gift Card where you can send great notes and gifts out showing you support the NO DAPL resistance standing with Standing Rock - Artwork by John Pepion (Pikini).